On the way to gym club today we passed the hospital as usual. But unlike usual I was beeping my horn in support of the junior doctors standing there in the hail, on strike. I don’t usually talk about political issues on here – that’s not the reason I started blogging and I’ve seen too many discussions on the internet descend into name-calling and slanging matches. I’m not going to go into all the ins and outs of the arguments in this battle between them and Jeremy Hunt. Suffice it to say that these are not petulant toddlers, stamping their feet and whining that they don’t want to work harder. They are dedicated professionals who put in long hours to get this far and already work damn hard. People who deserve better than a forced imposition of an unfair contract. I know there are problems in the NHS; long waiting times, unequal access, and so on. But I don’t believe this is the way to tackle it. And I worry that this is just the start of the NHS being dismantled piece by piece. This fight isn’t just about junior doctors – it’s about what comes next. Who will be next in the firing line? Nurses? Consultants? What do I know? I’m just an individual, a mother. All I know is that the NHS has been a life-saver for us over this last year. Literally. The NHS was there to diagnose Pudding’s mucopolysaccharidosis. It was there to offer treatment within a week. It was there to arrange all the tests and screening to check his vital organs. It was there to pick up the pieces when I cried every week. It was there to help us get onto the clinical trial that may save his life. It is there offering a safety net if we need it. I am so scared that one day it won’t be there. So, junior doctors, I stand with you. I was reading a book (yes, fiction, I was actually reading fiction) yesterday evening. I reached the end of a chapter, turned to the next one and the chapter heading stopped my breath for a moment. It said simply ‘Hunter’. Certain words have been changed so much for me since Pudding’s diagnosis. When I see the word ‘Hunter’ in a book, or on a local estate agent’s sign, my mind automatically adds on ‘Syndrome’ and triggers all the emotions that go with that. As soon as I became a mother it became much more difficult to hear of any child being unwell or in trouble. I think it’s a natural thing – you can’t help but consider the awful possibility that but for the luck of the draw it could be your own child. Yet now, when I unexpectedly hear something similar it hits home so much harder. A joke about the ‘stupid class’ at school, isn’t a joke any more. Hearing a story about a mother losing her teenage son it’s not just a story, or a distant possibility. Words can make me want to slam my hands over my ears and walk away. Keep on walking and never come back. Whoever we are, words always pass through a filter according to our own culture, background and experiences. I guess my filter is pretty sensitive right now. The other side of this new awareness is that I am now so much more careful of the things that I say or do too. I am trying not to judge so much. Child misbehaving at the soft play? Maybe he has ASD. Chance encounter with rude, unsmiling person? Maybe they are dealing with their own world caving in. The internet seems to be littered with trolls and rude comments, even on the sort of sites where you would think that supporting each other would be most important thing rather than arguing about whose way of approaching a problem is right. We can never really know what our own words and actions mean to someone else. All we can do, is act with compassion wherever possible. And not use our words to deliberately hurt – there is enough pain in the world already. Sometimes I find it hard to believe that the six-year-old boy who can use the logic of statement 1, can also fling statement 2 at me in a rage. I actually sat down to write about Pudding’s speech and language skills, but as soon as I typed the word ‘communication’ it was Twiglet that sprang to mind. I know I can’t be the only mother to have issues around communication. He is a fabulous boy – bright and funny – but he does drive me to absolute distraction sometimes. Almost always it is to do with Pudding. 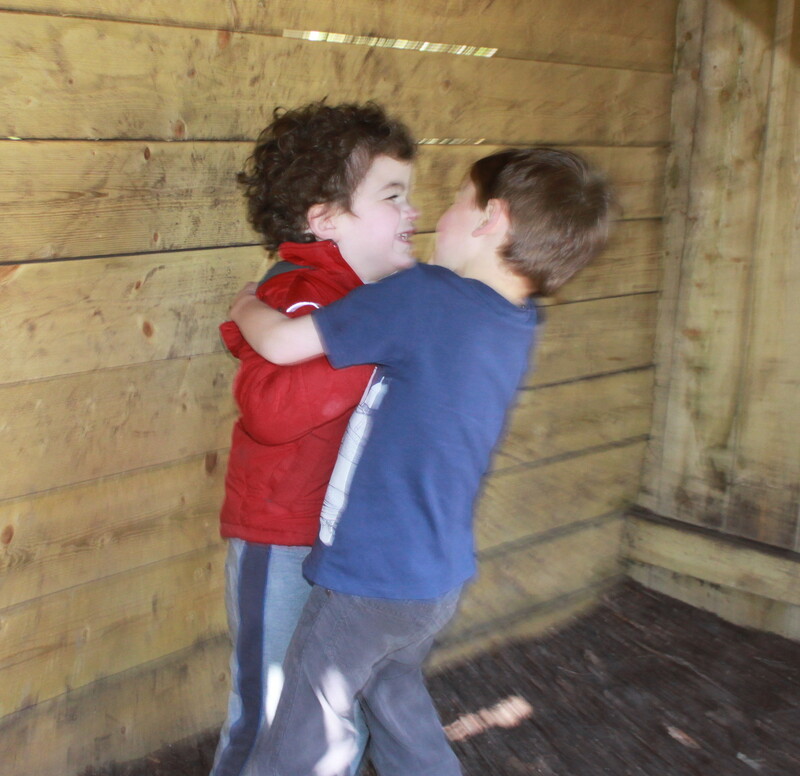 He loves his brother dearly, that much is certain. But it’s a strain on anyone if they get hit often. Randomly. For no reason. And its not really surprising that he snaps and screams in Pudding’s face or hits back. I try to get him to respond in a consistent way, as that is the only chance we have of getting Pudding’s behaviour to change. So it is frustrating when Twiglet can’t do that. And yes, I probably start sounding pretty sarcastic when I try to intervene and that is when I get the hurtful comments shouted at me. I am pretty honest with him – I tell him when what he has said has hurt me, and he does see me cry. Things have actually been a lot better over the last few weeks as we’ve addressed some of the other flashpoint issues of Twiglet’s behaviour (the potential reduction in gaming time at the weekend has made him much more willing to carry out his jobs!). This seems to be having a knock-on effect on how well he manages his temper at other times too. And of course, the more aware I am of my own reactions, the better I deal with him. I always worry though, about whether I am getting the communication right regarding Pudding’s condition. We have a fantastic book that has helped him to understand MPS and the sort of effects it has on children. So he knows quite a bit about why his brother is different but then there is also the biggy, the elephant in the room. We have never talked to him about life expectancy. The clinical trial may mean that we never have to. Even if that is not to be, we have years before we need to have that discussion. I hope. But it means that there is always something I’m keeping from him. I can never truly say why I may be more tired or stressed than usual. I never tell him, ‘Your brother may die’. I’ve complained about paperwork before – the reams and reams of forms and admin that take up so much of the day as a special needs mother. But it does often serve a very useful purpose. The latest being one which will have a big impact on Pudding’s future over the next few years; the Education, Health and Care plan. I mentioned in a previous post that I wasn’t much looking forward to the meeting just before Easter. Actually, though, it was fine. Hubby had a day off work anyway so came along too; also there was our Portage worker, Speech therapist, key worker from playgroup and our local pediatric consultant. This was the first time that all these people had been in the same room, all focussed on Pudding and his needs. There was some discussion of the positives – achievements that Pudding has made lately and things that we can carry on working on. But yes, of course, we had to talk about the negatives too. Yet again, we had to face that question, ‘What do you want for your child in the next 3-5 years?’ (Simple answer: what any other parent would! Long answer: we hope upon hope that the clinical trial works well for him then we might see him continuing to gain skills and language). But this time, with some of my post-diagnosis turmoil fading, it wasn’t so bad. The meeting covered a huge range of issues, from the need for support at mealtimes to stop him stuffing too much food in his mouth at once, to how to evacuate him from school if he refuses to move when the fire alarm sounds. Strangely reassuring that these things are taken into account! Less than two weeks later we got the news that the panel had agreed his EHCP. Hoorah! Up until now I’ve found it very hard reading sentences like ‘P is significantly behind his peers in every area’. But this time I welcomed it. Sentences like this mean that hopefully he will be able to start at school with a clear understanding of his needs, and won’t just be labelled as a difficult child. The next stage is for the EHCP to be sent to school and for us to start talking about his transition. Of course they have final decision on how his special educational needs funding is actually spent, but we all know that if he doesn’t get one to one support, they would soon regret it. Ah, the chaos that he could cause…. And the best thing from this process? One simple line from one of the reports feeding into the EHCP – “P is a delightful little boy, who is a joy to know”. This filled me with sunshine when I read it. My gorgeous son will probably hit other children sometimes, pull all the books off the shelf and eat the play-dough, but I know he will be liked, and when it comes down to it, that is what is truly important. Tonight I found some of the most beautiful words I have ever read and I want to share them with you. Did you understand all that? Thought not! It may not seem a very beautiful piece of writing to you, but to me it means the possibility of a cure, the greater possibility of life beyond the teenage years, the possibility of no more weekly infusions. Anyone need a translation? Basically, it’s one of the ways that is currently being developed to deliver gene therapy. It would get Pudding’s body to start producing its own enzyme. But more excitingly than that, it would halt the progression of disease in his brain too. It’s still a way off. They won’t be filing a request for a clinical trial until 2017. And it will be a long drawn-out process with its own risks and inclusion criteria. But there’s time and there’s hope. Hope for Pudding and the other boys like him. I’ve known for a while that gene therapy is in the pipeline, but there is something about seeing something like this in print that means so much more. So look back over those dry clinical phrases, and perhaps you can see how beautiful they seem to me…. Have I ever said? I loathe MPS with a passion. I loathe it with every millimetre of my body, every breath, every beat of my heart. I loathe it and yet am powerless to do anything about it. If it was a person I could tell them how much I hate them (though I probably wouldn’t). As it is, I just have to put up with anything it throws at us. I have to watch from a distance as people I have become friends with struggle through similar problems. Others face much worse as their children lose skills, get more difficult to manage and then, heartbreakingly, become more compliant as they decline further. I hate it. I hate it. I hate it. I know this happens to me every so often; just as I think things are going along just fine something hits me again. After Pudding’s third dose of trial meds this week, he woke up from his nap and started crying. He couldn’t be comforted with tv or food, both of which are normally sure-fire winners, so of course we started thinking it could be a reaction to the enzyme. He fought like mad as we tried to get some paracetamol and antihistamine in him. He turned to me and cried, ‘Mummy!’ as if I could do something to stop this happening. And I should be able to, shouldn’t I? I’m his mother and that’s what we’re there for, to protect them from harm and stop the nasty things happening. But I can’t, and in that moment I felt so helpless and overwhelmed. Soon after that he vomited and he was sick another few times during the night – not much fun when you’re alone in a hotel room with a screaming child. Given the reactions he has had previously after his weekly infusions it wasn’t really a great surprise. So next time we’ll rethink the pre-meds he gets to try and avoid it happening again. It wasn’t really a big issue – reactions like this do happen, they can be managed and trying to second guess whether they will worsen is pointless. But I think it highlighted something for me. I am no longer in the emotional turmoil following diagnosis, but the anxiety still never completely disappears, even if it is hidden under a veneer of ‘normal’. So when something does come up I probably react more than the situation warrants. That can be MPS-related or another matter entirely, hence shouting at Twiglet if he’s pushed the wrong button for me. I guess the only thing I can do is try to recognise this, and accept that it will keep on happening. I am not a superhero, and I am allowed to cry. I’ve realised the major problem with blogging as an introvert is that it’s easy enough to write the posts, but I’m absolutely hopeless at promoting them. When Pudding was first diagnosed, I searched the internet night after night, and in the early mornings when I found it impossible to sleep. I was desperate to find information on what I was facing; not just medical information, but what it was actually like for families navigating their way through this situation. I did find some US blogs, but these had less relevance for me – the cultural background and healthcare system being so very different from our own here in the UK. Gradually I came to realise that I was writing just what I wanted to read myself. What if I could give this to someone else just newly diagnosed? Perhaps they too would be trawling the internet, desperate to find someone to tell them what they were feeling was normal. Perhaps they could find a blog that could give them a bit of comfort. Perhaps that blog could be written by me? And A Hunter’s Life was born. It became a way to keep friends and family up-to-date with our latest news without having to hold back the tears if they asked a direct question. But also, more and more, I have wanted to raise awareness of Hunter Syndrome and MPS. With a rare disease, the more knowledge there is out there, the more likely a diagnosis can be made before too long. 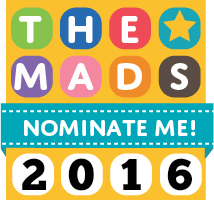 So…with that in mind, please could you vote for me in the Mum and Dad blog awards?Nominations close on the 8th April. Only those with a decent number of nominations will get through, and I know there aren’t many of you reading this, but nothing ventured, nothing gained! I’ve been going for less than a year, so Best New Blog seems like the most appropriate, and you could also spread the love by nominating any other UK blogs that you read and love.